Sure enough the first thing I look into the lineup is who will be performing that night! but did you know that they will also be introducing a new cocktail for that night call the “circuit night”? well now you know=p Well since the first circuit night, which obviously was a hit, they’ve been bringing different and new series of race parties for loyal fans! and this year, we are going Korea baby! 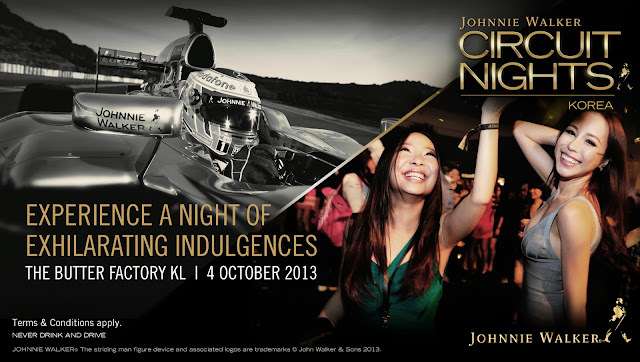 In conjuction with the Korean race weekend, Johnnie Walker is gonna rock our nights with DJ DD Lee! She’s the first Korea female DJ battle champion! How’s your Friday night looking so far? Mine’s looking rather darn good! I’ve always liked Johnnie Walker events, particularly because they always emphasizes on drinking responsibly, their parties are always so sophisticated and also extremely classy. Heck they even got Mika and Jenson to join their pact to NEVER DRINK AND DRIVE. The Never Drink and Drive messages is ALWAYS reminded to the people who are attending the events, and they go as far as providing water to guest after parties. Winners always stay in control, which is something that I truely believe in. I’ve always looked up to people who has a certain amount of self control to not let their emotion take over and make silly decisions that could potentially make them regret for the rest of their life. Am I prepared for the night? Well,the dress code for that night is rather straight forward, you just can’t go wrong with black and gold,so consider that settled, but how should my makeup be this coming event? I thought about it, Was gonna for a black smokey eye but then I decided not to instead. I probs will up the eyeshadow to make it look more dramatic on Friday and change the shadow color to Gold to suit the theme but I thought I should share how I usually do my events makeup. Here’s the quick tutorial for a makeup that will be almost suitable for all events and super easy to recreate! Of course firstly you will need a smooth canvas to have your other makeup applied on smoothly. These are my friends to creating a smooth looking skin. Make sure to blend it well if you are using a creamy texture. Hah, and we move onto the lips. I generally like using a lipliner before applying my lipstick to give myself a guideline to where the lipstick application should go. and if you have this gold lipstick from Dior, you can use it straight but if you haven’t got anything similar, using just gold eyeshadow and dab it on the middle of your lips will give your lips instant boosting effect. This will make your lip super 3D and it will look really really luscious. Apply mascara, or fake lashes if you are heading out at night and we are good to go! See you all Friday at Butter Factory!